Since my little guy isn't going to be in preschool until next year, we're trying to do a lot of educational, hands-on activities and crafts at home. With fall around the corner, I wanted to find some fun seasonal activities for us to do together. We love the colors of the fall season, and here in NC, some of the leaves are already changing colors and starting to fall. 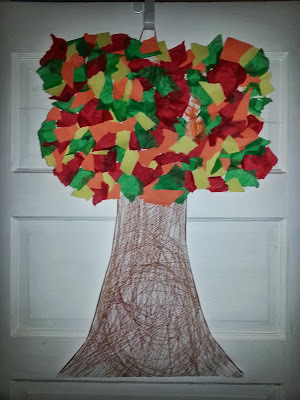 So, we decided to make a Fall Blessings Tree, filled with lots of fall color! 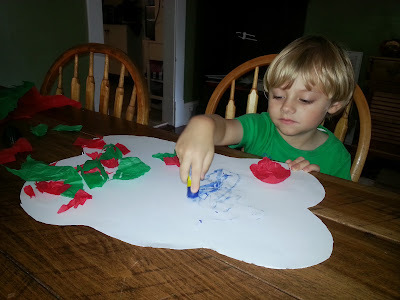 Start by cutting one sheet of paper into a tree topper shape, or cloud shape. Allow your toddler to have fun tearing sheets of colors tissue paper into small pieces. Help your toddler cover a small area of the tree topper with glue, and then instruct them to stick the different colors tissue paper pieces to the tree topper. This lets your child work independently, with you standing by to help, if needed. Learning about colors, textures and what happens to trees in the fall, of course! 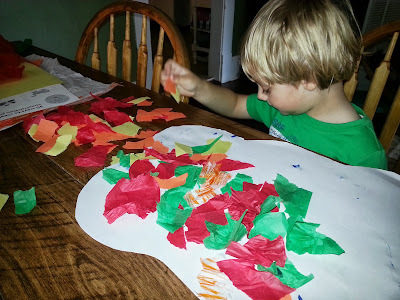 After the entire tree top is covered in paper pieces, cut out a tree base shape on the 2nd large sheet of craft paper. 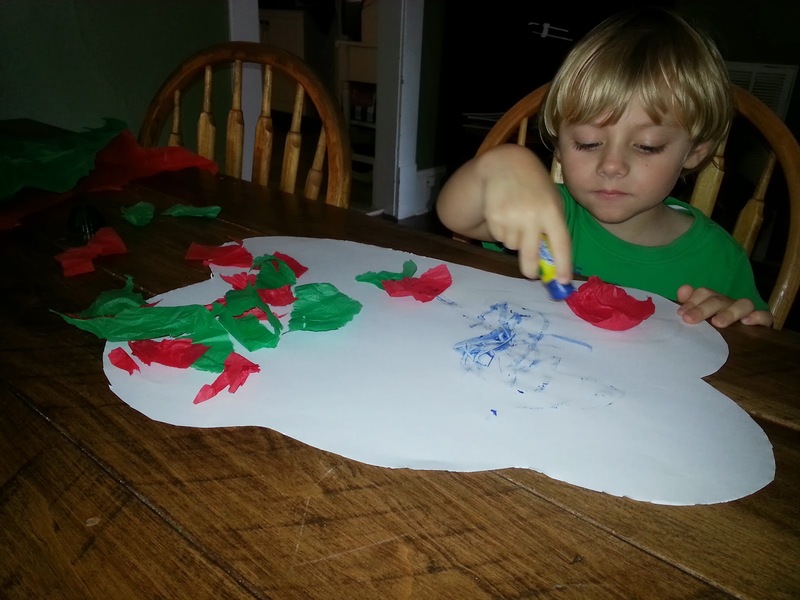 Have your child help color the base of the tree brown with crayons or markers. Glue the tree topper to the base of the tree and then display it in a prominent spot for all to see. 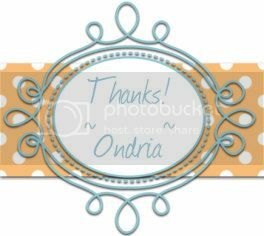 It makes a beautiful fall decoration for you home, and you and your child will both be proud to show off their handiwork! I attached a rubber band to the back of the tree, and we hung it up on B's bedroom door. As the fall season wears on, you can add paper leaf cut-outs to the door (or wherever you display your tree)- maybe one for each new day. On each leaf, write down something or someone that your child is thankful for. By the time Thanksgiving rolls around, you will see a multitude of blessings on display, which you can praise and thank God for together, as a family. We can't wait to show you what our tree looks like as we begin adding our many blessings! Praying the start to your fall season is beautiful and filled with peace and love! What a perfect toddler craft! Easy and fun! this is just perfect for me to do with my princess.thank you for sharing.